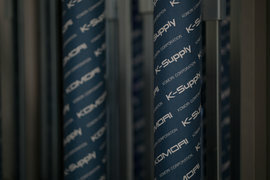 K-Supply, our service providing customers with the ability to order at best price, pressroom supplies that have been tested at Komori Graphic Center-Europe and approved for optimal use with Komori presses. 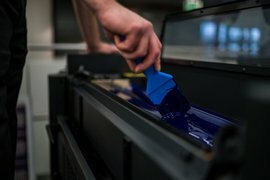 Komori has transitioned from being a press manufacturer into a Print Engineering Service Provider (PESP). We offer total printing solutions and everything you need in your press room. We have created partnerships with first-class, world leading organisations to expand our ever-growing K-Supply product portfolio. All products within this portfolio have been thoroughly tested in our KGC-E, adjusted and perfected after that. 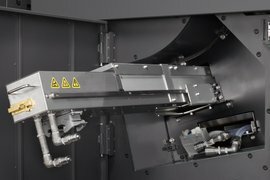 This guarantees that all K-Supply products work perfectly on Komori presses. Our K-Supply product range is divided into six categories, as you can see in the colourful image on top of this page. Each category has its own colour and icon, which we use throughout the K-Supply promotional materials. The picture on the left shows the actual leaflets and a folder, also with the colour-icon combination. The colourful combination is also used in the Komori Europe app. The K-Supply product range is easily recognizable by being divided into the six categories. 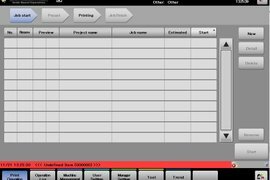 Besides the K-Supply products, all other Komori equipment is shown in this app as well, just as Events and links to our social media channels. “Komori’s fast growing K-Supply portfolio is filled with products for every printing press out there. 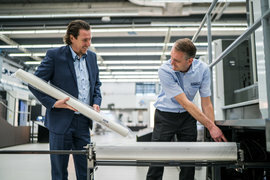 Komori offers it all and of the best quality."